Since 1975 Crabtree Aircraft Co. has called the Guthrie-Edmond Regional Airport home. Our company serves as a full line Fixed Based Operator for this airport, offering maintenance services, as well as fuel and oil services, for pilots in the Guthrie and Oklahoma City metro area. The Guthrie-Edmond Regional Airport began as a grass airstrip in 1941. In 1968, a 3,000 foot paved runway was constructed. The airport was improved in 1998 with the closing of the grass runway and an extension of the paved runway to 4,100 feet. 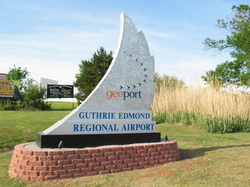 In 2005, the City of Guthrie entered into an agreement with the city of Edmond in a co-sponsorship of the airport. Only a year later the airport received the Outstanding Oklahoma Airport Award. Crabtree Aircraft Co. is proud to be the Fixed Based Operation servicing the Guthrie-Edmond Regional Airport, and is happy to meet all of your needs. Airport diagrams and other pilot information about KGOK can be found here, courtesy of airnav.com. -After approx. 2 miles, turn right on Airport Rd.